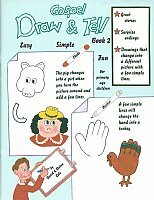 27 awesome Draw & Tell Stories. A very exciting way to teach children a method that is sure to get their attention and keep it. Wiggly children are so fascinated that they lose the wiggles and absorb the lesson. When the magical moment comes to transform the picture, you will hear: Wow! Neat! This is fun!. List, The Christmas Tree, The Best Things About Easter, Happy's Discovery, Joy, Stirring Up Kindness, The Dragon Fly, Honest and Brave, A Wonderful Home and many more.